QuickBooks users looking for warehouse inventory management software should make sure that the one they choose integrates with their accounting software.QuickBooks is a great tool for tracking finances, but it’s not equipped with the tools necessary for tracking inventory. Businesses that use QuickBooks need an add-on with comprehensive inventory management features to help them effectively run their warehouses. 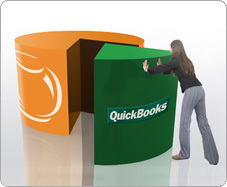 With integrated QuickBooks warehouse inventory software, businesses can eliminate the need for double data entry. They can simply scan a product’s barcode to place an order, receive it into the warehouse or sell it to a customer, and the corresponding change is simultaneously added to the company’s financial records in QuickBooks. The symbiotic relationship between QuickBooks and warehouse inventory management software simplifies the tasks of both accounting and inventory management. Business managers can instantly update their accounting books as they sell and replenish their stock of products. That way, they know how much working capital and inventory they have available at all times.